The emergence of Worcester County Bengali Association (WCBA) started almost 20 years back, with about 10 -12 Bengali families who lived in Worcester county area. In regular weekend gathering of these few families, a thought of forming a small community was discussed and with the encouragement and support from each other an informal association was created. The idea was to keep it small and closely knit within this group and plan on organizing a few programs which will be related to Bengali culture and religion. Saraswati Puja used to be our main function in those days. However, constant enthusiasm and deep willingness of every one in the group, later in year 2001, WCBA launched first Durga Puja celebration. In the mean time some more families have joined this organization and we are now about 20-22 families, who jointly plan, organize and manage all our functions successfully. Offering utmost hospitality to our guests has been our primary objective and today that quality stands as an identity of WCBA. The organization looks forward to offering well organized functions to serve and entertain the community and also stay engaged in providing charitable services to the best of its ability. WCBA is a small but strong organization, but the success of this organization has been possible mainly because of your gracious presence and generous support in the Puja activities throughout the last decade. WCBA has been celebrating Saraswati Puja for several years now. Saraswati, the consort of Brahma (and thus also called Brahmi), the creator, is the goddess of knowledge and wisdom. She resides within us and on Saraswati Puja day, we invoke her blessings. Saraswati Puja is a festival where families come from all over the place to pray for the well-being of everyone. They also get a chance to meet old friends, make many new friends and enjoy the auspicious festival which is comprised of profoundly divine Puja, attractive cultural programs, of course, our most favorite offering “delicious food”. To enable this, WCBA strives hard to provide you with a heartfelt welcoming environment where you will be drawn in close to feel that it is your own Puja, and find the occasion a never to be forgotten experience absolutely filled with warmth and fellow feelings. 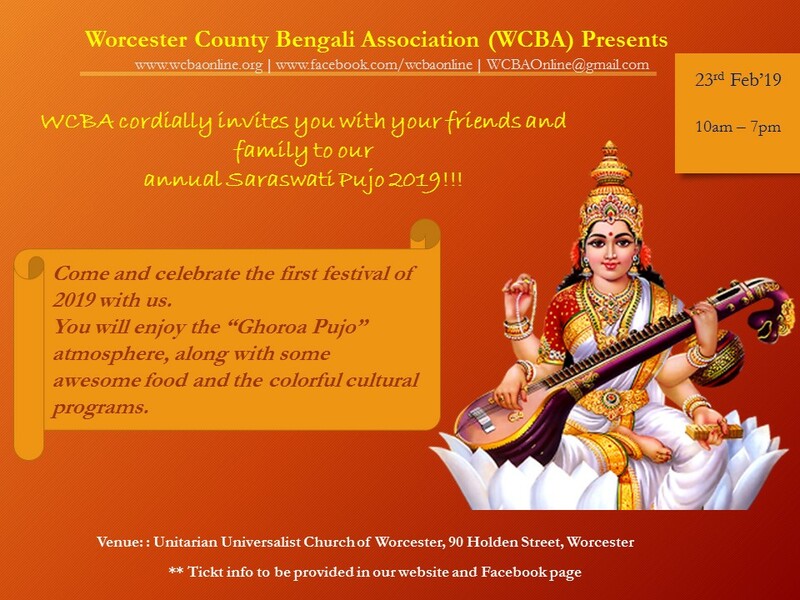 As always, we extend our sincere invitation for you to join us during this year’s Saraswati Puja in Worcester. We will eagerly wait to receive you with a warm welcome!